According to a recent survey, almost 70 percent of Japanese people do not have friendly feelings towards Korea, suggesting a growing distance between the two East Asian neighbors. The survey, conducted by the Japanese government between October 16 and 26, showed 66.4 percent of Japanese respondents saying that they do not have friendly feelings towards Korea, the highest figure since data was first collected in 1975. The survey targeting 3,000 Japanese people aged 20 and over. Only 31.5 percent of respondents answered they feel close to Korea, down by 9.2 percentage points from the previous year. In the 2009 survey, 63.1 percent of people said they felt close to Korea. Growing discontent with Korea in Japan is not new, and in fact has resulted in the emergence of an anti-Korea movement. That in turn has placed Japan under considerable pressure from the international community to halt the violent protests and hate speech. The Japanese government was warned on July 24 by the U.N. Human Rights Committee that it needs to put an end to the anti-Korea activities, noting that victims of hate speech have insufficient protections. Amid the growing concern, Japanese Prime Minister Shinzo Abe on October 1 expressed his regret for the hate speech problem in Japan, adding that he would try his best to stop through education and proper guidance. Nothing about regulating it legally was mentioned. In addition, the opposition Democratic Party of Japan met on October 28 to review a new bill, which would regulate “hate speech” in Japan, especially that targeting the Korean community. It was reported that the Japan Innovation Party would join in the proposed bill. The news was seen as a significant step for Japan, since the Japanese government had been reluctant to act, worried about interfering with laws protecting free speech. South Korean lawmaker Shim Jae-kwon thinks the free speech argument is just an excuse from the Japanese government. The “Anti-Korean movement by Japanese people has gone too far. They are not reluctant to say something like ‘kill Koreans’ or ‘Koreans are like roaches.’ It is hard to categorize that as free speech,” said Shim. Shim recently announced a resolution with other 16 South Korean lawmakers, calling on the Japanese government to take concrete action against anti-Korea movement. 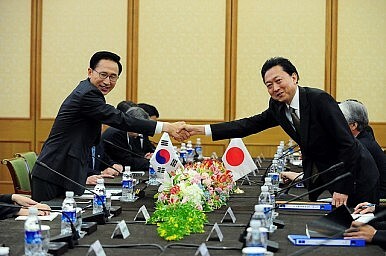 The resolution also demands that the South Korean government make a diplomatic effort to solve the problem with Japan. Meanwhile, South Korean people have deep concern over the conservative shift of the Japanese government, widely considered one of the main factors contributing to the anti-Korea movement. According to a survey by Mono Research last year, 83.6 percent of South Korean people thought that the rightward shift of the Japanese government was something to worry about for Korea-Japan relations. In the survey, 33.1 percent of respondents said Japan’s view on the comfort women issue and distortion of history were worrisome, while 28 percent of people said that they worried about a Japanese tendency towards militarization.